The Jewish community in Rome is more than two thousand years old, is also the first in Italy. 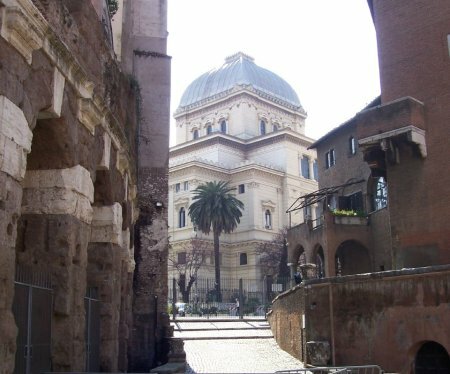 From the early settlements in the Trastevere area, the Jews of Rome were forced to move into the ghetto established in 1555 where they lived for over three hundred years in a very difficult environment. Today the Ghetto or the Square as Jewish residents call it is where the memory of the holocaust still lives strong but also where the community gathers to celebrate or simply to have a good social life. The Jewish Ghetto is a quaint place where the Jewish and the Roman blended in centuries ago giving life to something unique. The main street leads to the gateway to the porticus of Octavia, built by emperor Augustus to house the Greek originals. To the theatre Of Marcellus, dedicated to Caesar’s adopted son and to the Synagogue overlooking the river Tiber and its island.